An aromatic green fragrance set to invoke the barbershops of old. 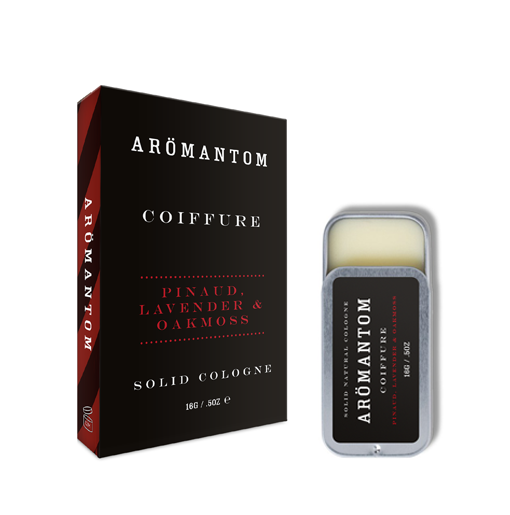 Set with top notes of rosemary, star anise and bergamot; middle notes are lavender, cloves, geranium and coumarin; base notes are patchouli, guaiac wood, vetiver and oak moss. This multi-layered fragrance rests on the skin brilliantly. Our solid colognes are handmade in small batches to ensure a high quality product made just for you. Each one contains a unique masculine fragrance which not only helps you to smell fantastic when you need to; it also moisturises and protects your skin from whatever life throws at you. Try applying it right after a shave to help soothe and moisturise your skin. Using your Solid Cologne could not be simpler; to apply, dip or swirl finger in cologne and apply to pulse points such as wrist, behind the ears and neck… and go! They are places on the body where your heart rate can be felt through blood vessels that are closest to the skin. Some of the most common ones are found on the neck, wrists, behind the knees, inside the elbows, and temples. By applying our solids to these points, it helps emit the aroma for a longer period of time. The warmth of the skin helps the fragrance do its thing. If you want to apply more, you can always dig into the solid for a small amount and then apply to pulse points. Store in a cool dry place – do not leave in a warm car. Apply in small amounts to test skin for sensitivity. Shea Butter, Beeswax, Jojoba Oil, Fragrance, Essential Oil. Can’t decide on fragrance? Our Quint Pack is available.